OWINGS MILLS, Md. (AP) — With rookie quarterback Lamar Jackson likely to make a third straight start Sunday, the Baltimore Ravens’ offensive linemen are gearing up for another delightful afternoon of plowing straight ahead as part of the team’s suddenly formidable running game. Joe Flacco didn’t practice Wednesday and is still waiting to get medical clearance following a hip injury that’s kept him sidelined since Nov. 4. With Jackson and rookie Gus Edwards leading the way, Baltimore rushed for 267 yards in a win over Cincinnati and another 242 last week in a 34-17 rout of Oakland. The Ravens are looking more of the same against the Falcons (4-7), who own the league’s 25th-ranked rushing defense. “We’re having a blast,” rookie right tackle Orlando Brown Jr. said Wednesday. Baltimore lost three in a row before Jackson took over for Flacco and started getting the ball to Edwards, who replaced Alex Collins (foot injury) as the featured back. 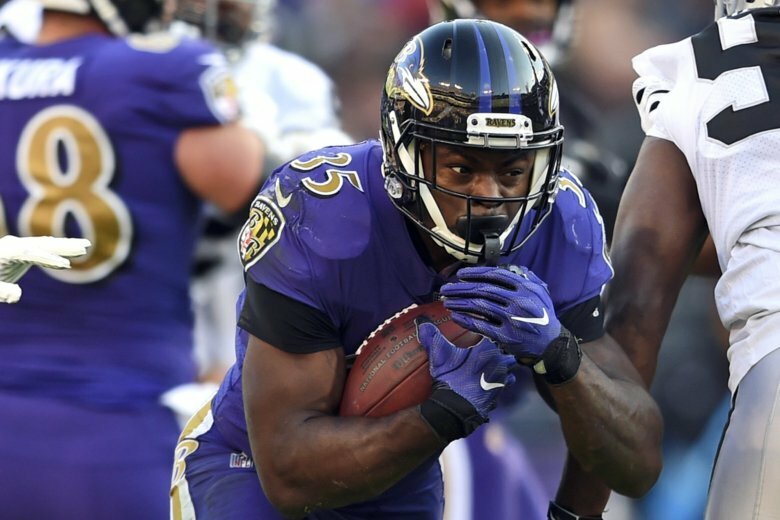 Employing the run-pass option — a staple for Jackson at Louisville but a rarity in the NFL — the Ravens are averaging 5.30 yards per carry over the past two weeks. It all begins with Jackson taking the snap, then either handing the ball to Edwards or dashing off on his own. Jackson’s speed and elusive qualities are almost impossible to duplicate in practice. There’s no bluster to Edwards, who speaks softly and has a reputation for being very low key. Lately, Edwards have given Baltimore’s offensive line a reason to grin.